Classic Jay Ward properties will be reintroduced for fans of all ages this fall! San Diego, CA (April 27, 2013) – IDW Publishing, along with DreamWorks Classics and Bullwinkle Studios, have teamed up to bring Jay Ward’s classic characters and stories back to comics! 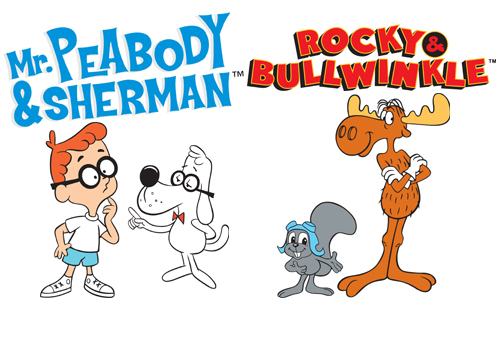 Beginning this fall, fans will see the return of Rocky & Bullwinkle, Boris & Natasha, Snidely Whiplash, Mr. Peabody & Sherman, and Dudley Do-Right, just to name a few. In anticipation of DreamWorks Animation’s 3D comedy adventure Mr. Peabody & Sherman coming to theaters on March 7, 2014, IDW will release a comic series. ,Additionally, IDW is planning a brand-new Rocky & Bullwinkle series for early 2014 release. While creative details have yet to be announced, there are also plans for reprints of the wealth of previously published comics based on Ward’s colorful characters. At once hilarious, heart-warming, and ahead of their time, this cast of characters, first introduced by Jay Ward in 1959, have delighted generations of all ages, and needless to say, IDW can’t wait for fans to see their return to comics! Did you know that Capstone is a Silver Sponsor of this year’s FREE COMIC BOOK DAY? On May 4 comic book fans will be introduced to Mr. Puzzle, a superhero who’s a perfect fit for all problems. With his incredible powers, Mr. Puzzle can stretch, bend, shrink, grow, and will work hard to keep the folks of Busyville safe from trouble. What a nice guy! Mr. 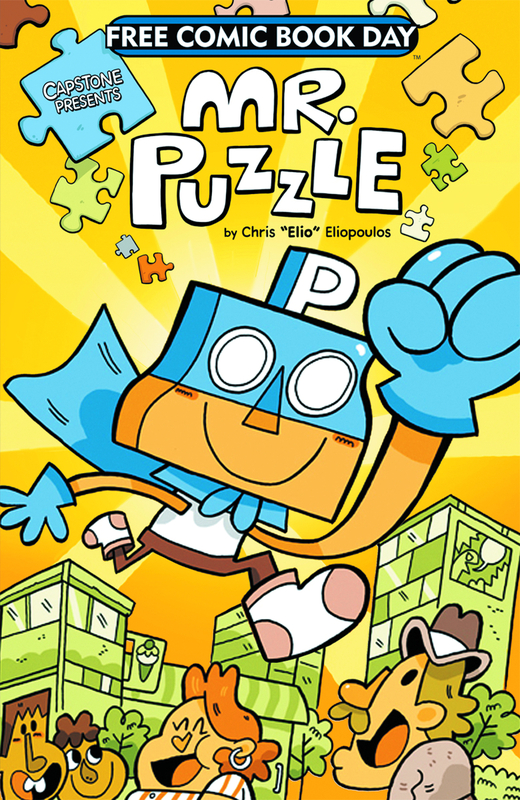 Puzzle is written and illustrated by Chris “Elio” Eliopoulos, creator of popular all-age comics from Oni Press, Kogama Press, Boom!, V12 Kids, Namco Bandai, and Top Shelf including Okie Dokie Donuts. You can download a preview of the comic on the FCBD site here. Capstone will release a full, 128-page graphic novel Mr. Puzzle Super Collection! this August. We already have a digital galley up on NetGalley here, and a book trailer here. Who is Mr. Puzzle, you ask? Well, he’s the perfect fit for any problem, of course! And Capstone brings him to you for the perfect price…FREE! Follow Mr. Puzzle on two exclusive, never-before-seen adventures by Chris “Elio” Eliopoulos. Watch the superhero stretch, bend, shrink, and grow, all to keep the folks of Busyville safe. Don’t miss this two-for-none of fun with Mr. Puzzle!! April 24th, 2013 – Los Angeles, CA – KaBOOM! Studios is proud to announce the official launch of the iTunes app GARFIELD COMICS by KaBOOM! The new GARFIELD app allows for fans to have fun, interact with other fans, get the most up to date information, and purchase GARFIELD comics. GARFIELD COMICS by KaBOOM! is free to download through Apple’s iTunes app marketplace. Digital comics and graphic novels can be purchased directly through the app using the user’s iTunes account. BOOM! Studios has a long history of groundbreaking initiatives in the digital comic space including being the first independent comic publisher to launch its own branded digital comic app with the PEANUTS COMICS APP which launched early November 2012. The GARFIELD Comics by KaBOOM! App was developed by Snapplify (https://www.snapplify.com/), a mobile solutions provider that enables publishers, authors and content providers to package their books, magazines and brochures into digital publications for company branded Mobile Apps. 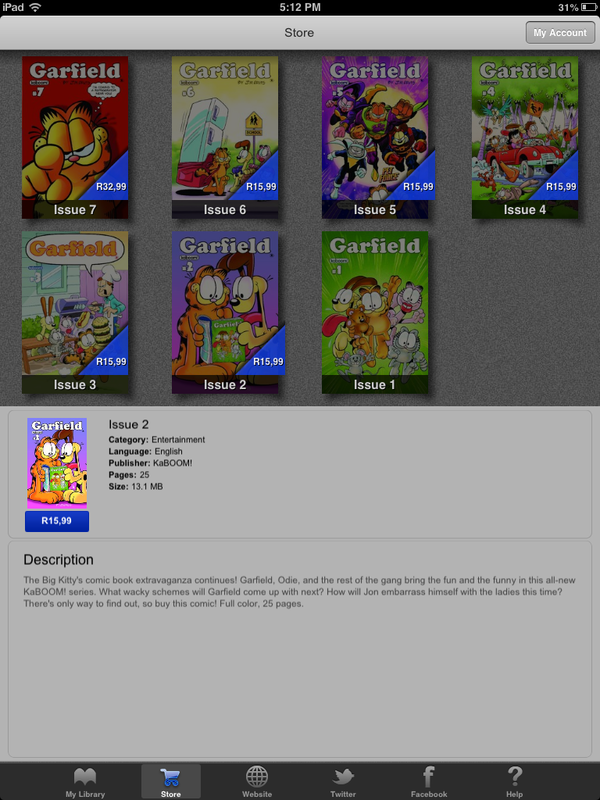 Issue #1 of GARFIELD is free to download in its entirety through the GARFIELD COMICS by KaBOOM! app and all other singles are at their usual pricing of $3.99. Four weeks after a new GARFIELD comic is released, the price of the issue purchased through the app will drop $1.99. Founded by Ross Richie, 2009 and 2010’s “Best Publisher” BOOM! Studios (www.boom-studios.com) generates a constellation of bestselling Eisner and Harvey Award-winning comic books and graphic novels with the industry’s top talent, including Mark Waid’s IRREDEEMABLE, Dan Abnett and Andy Lanning’s HYPERNATURALS, new HELLRAISER comics written by Clive Barker, PLANET OF THE APES, and Sam Humphreys’ HIGHER EARTH. BOOM!’s all ages imprint KaBOOM! publishes Charles Schulz’ PEANUTS, Jim Davis’ GARFIELD, Cartoon Network’s ADVENTURE TIME, and 20th Century Fox’ ICE AGE. BOOM!’s lit comix-focused imprint, BOOM! Town, recently won the Eisner Award for its first book, Shannon Wheeler’s I THOUGHT YOU WOULD BE FUNNIER, and just released SPACE DUCKS, the first comic book from indie musician legend Daniel Johnston. introduced to the world in just 41 newspapers and is now the most widely syndicated comic strip ever, appearing in 2400 newspapers. The success of the comic strip spawned a popular animated TV show, “Garfield and Friends,” which appeared on CBS-TV from 1988 to 1995, and is currently in worldwide syndication. In 2009, “The Garfield Show” debuted on Cartoon Network USA and now airs in 135 countries. PEOPLE magazine called the show, “One of the Year’s Best New Kids’ Shows” in 2009. Garfield also entertains his fans on a popular website, garfield.com, and engages kids in interesting and pedagogically sound activities to promote literacy at professorgarfield.org. English, Science and Life Skills are among the topics Garfield and his pals address atlearninglab.org, a public service of the Virginia Department of Education. Garfield has long been considered a “classic” or “evergreen” property because he has not only endured, but continues to be fresh and funny after 35 years in the limelight. Follow Garfield, along with 8.7 million other fans, on Facebook (facebook.com/Garfield) and Twitter (twitter.com/Garfield). Along with purchasing comics through the app, the app includes a live feed from the official Garfield Facebook page as well as a link to the KaBOOM! website. Both features will be accessible directly in the app. Additional features will be added to the app in the future.